(Sr3045) Mi. 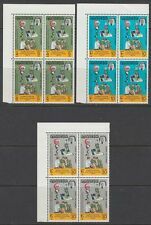 1961, Kuwait SG157, Gutter pair, fine used much scarcer than mint! Dies ist kein Muster, Sie erhalten exakt die abgebildeten Marken! Erhaltung: gestempelt, fine used. (Kwv416) Mi. 1194-1196 im 4er-Block, block of 4. This is no sample, you get exactly what you see. (Kwv589) Mi. 666-668 im 4er-Block, block of 4. This is no sample, you get exactly what you see. (Gb232) Mi.1206-1208. Dies ist kein Muster, Sie erhalten exakt die abgebildeten Marken! Erhaltung: gestempelt, fine used. 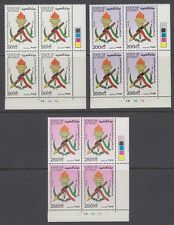 Kuwait: 1961: " 1d Orange, Definitive ". Unmounted Mint. (SALE WEEK.3). (K334) Mi. 760-791, je im 4er-Zdr. 1964 Definitives (highest values). The SG catalogue value of these six blocks of 4 is £200. SG 229/234 (6 values in blocks of 4). 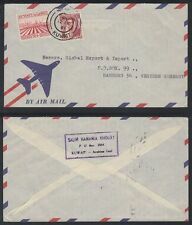 1959, Kuwait R-Cover to Germany, with "SALMIYA" cds. Dies ist kein Muster, Sie erhalten den abgebildeten Brief/Marke. This is no sample, you get exactly what you see. I WILL DO EVERYTHING POSSIBLE TO SOLVE YOUR PROBLEM. Kuwait local Cover, clean SAFAT cds, special cancellation "Arab Soccer Trophy". Dies ist kein Muster, Sie erhalten den abgebildeten Brief/Marke. Ahmadi Kuwait machine cancel of 25 April. Kuwait cds 14 December 1966. Dies ist kein Muster, Sie erhalten den abgebildeten Brief/Marke. with handwritten R-label. This is no sample, you get exactly what you see. Dies ist kein Muster, Sie erhalten den abgebildeten Brief/Marke. (Bm038) Mi. Block 3 im Faltklappkarton Folder. Nuevo anuncioF 258 Kuwait primer día cubierta 17 de abril de 1967, Monumentos de Nubia. Major Faults such as Pinholes, Major Crase e s, T hins and Tears that are not noticable from the scan are always Declared. CONDITON AS SCAN. CHINA VALUED OVER £10. Dies ist kein Muster, Sie erhalten den abgebildeten Brief/Marke. 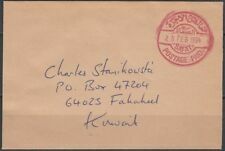 1934, R-Cover Kuwait to England. This is no sample, you get exactly what you see. If you buy this item and decide you don't want it. Cover Size - 24.1 cm x 10.7 cm approx. (Gb333) Mi.1604-1606. Erhaltung: gestempelt, fine used. This is no sample, what you see is what you get! (St3343 ) Kuwait Mi.111-A118. This is no sample, you get exactly what you see. (St3344 ) Kuwait Mi.111-A118. This is no sample, you get exactly what you see. COLONIA INGLESE - KUWAIT. CATALOGO YVERT N. 49/ 61. 13 VALORI NUOVI CON GOMMA ORIGINALE INTEGRA- MNH. SPEDIAMO SOLO TRAMITE RACCOMANDATA, ASSICURATA, CORRIERE ESPRESSO. (Ga065) Mi. Erhaltung: gestempelt, fine used. This is no sample, what you see is what you get! Note censor mark on back. Kuwait machine cancel 11 October 1967.